A few Serpent 733 notes after the last race. Currently I am preparing my car for the next local parking lot race. 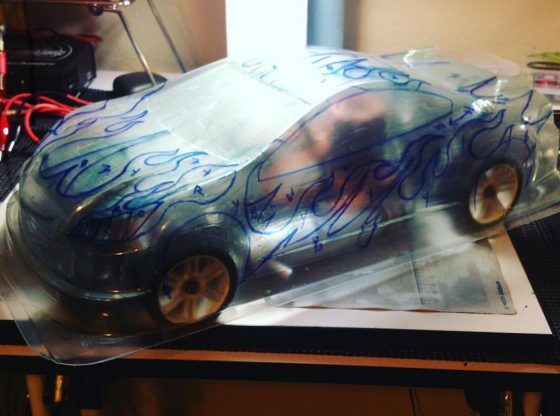 I have done a lot to the car itself it addition to the body in my previous post. I rebuilt everything so it is smooth and friction-free as possible. This car is very well made and not much shimming is necessary to reduce tolerances. I still have a couple slightly bent pivot balls that will be fine for the next race but will need replacement ASAP. Other than than the car is well sorted after working on it for a couple of weeks. Attached is my starting setup that is basically the stock setup with a spool (locked diff) in the front and thicker oil in the rear diff to maintain the balance.